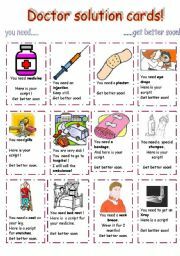 These cards can be used in role play together with the "doctor, I´m sick" cards offering a solution to the ´patient´. 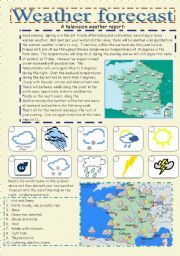 They are also good to revise vocabulary in context of situations. I hope you enjoy. This worksheet has 5 pgs and includes a key. 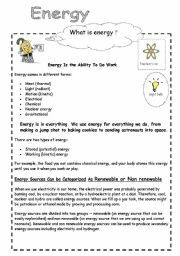 It defines energy and electricity and broad terms with associated worksheets. I hope you can use it for your more advanced students. 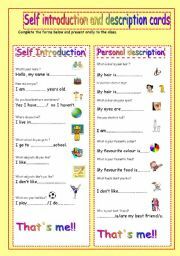 These two cards encourage students to talk about themselves and teaches ss how to introduce and describe themselves. 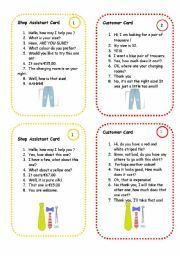 The cards can be used as an individual activity or as an activity in pairs as a Q + A. Goood way to start the new school year. SS can also characterise with different emotions to make it more interesting. 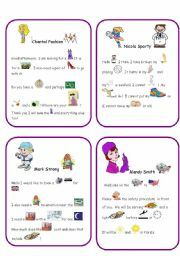 These 8 activity cards can be used for role-play. They encourage ss to speak and allows them recreate a doctor/patient situation. The doctor should mime the appropriate response. 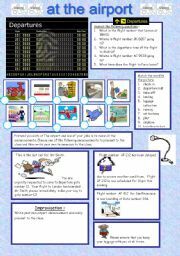 My ss loved this activity and have asked to repeat it several times. 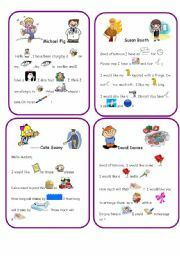 The medical worksheet can be used after this activity to reinforce vocabulary.Enjoy.